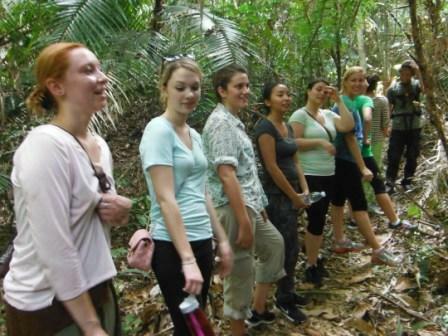 A group of students from the University of Colorado participated in a 5 day study tour with Andaman Discoveries in the first week of January. The goal of the tour was to learn about social and development issues in Thailand, particularly on labor and human trafficking. Led by Tui, as their guide and translator, the group was given an extensive tour of our partner communities and villages. They were briefed on the background and projects of the organization on the first day. Two video presentations were also shown during the briefing. After a delicious lunch of papaya salad, they finished the day with relaxing at the beach. The tour continued with a morning hike up the mountains in Koh Ra National Park. 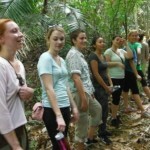 Together with two interns from Koh Ra Eco-lodge, the group experienced the beauty of untouched nature that the island offers and by the end of the hike everybody was left feeling accomplished and refreshed. Leaving Koh Ra behind with their spirits still high, the group journeyed on to their next destination, Ta Pae Yoi, a small fishing village in Koh Phra Thong for a well deserved rest.That evening everyone was treated to a scrumptious dinner of fresh seafood prepared by their homestay families. 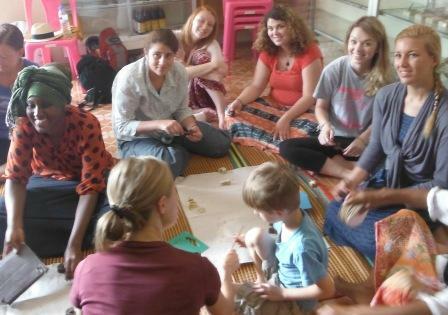 The group immersed themselves in local culture and activities such as offering food to the monks, enjoying a scenic tour of the Savannah, collecting local vegetables and even tasting a local dish of beetle bugs! 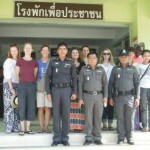 They also spent a meaningful time with the Moken community and the school in Ta Pae Yoi. 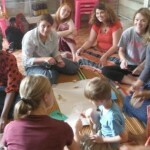 A visit to Ban Lion followed where they learned about the effects of the tsunami disaster relief efforts to the local community. 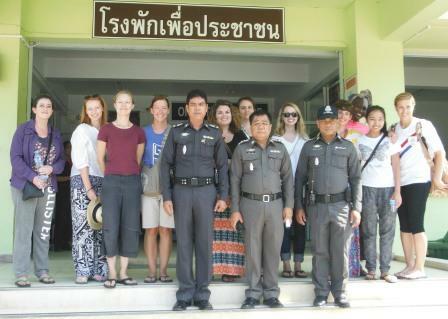 The next day they were given a presentation on immigration, drugs and human trafficking at the Kuraburi Police Station and was able to participate in an open discussion with the superintendent. They then took time to unwind with a hike to the Kuraburi waterfall. At their final stop in Ban Talae Nok, they participated in various activities such as weaving palm leaves and making soap with the women occupational group, making Thai desserts, and enjoying a barbecue of local delicacies at the beach with the villagers. The tour was a very meaningful and educational experience for everyone involved, and the group left with new knowledge, bonds and unforgettable memories.